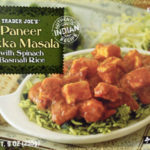 I was excited to see that Trader Joe’s came out with a vegan version of Chicken Tikka Masala, as I love Indian food but am dairy-free and try to limit my meat intake. The result? The sauce and the rice are absolutely delicious, total 5 star rating for those aspects. I’m actually really surprised at how good the sauce is, since usually those types of sauces are made with heavy cream, butter, and milk, and this tasted literally just as good as one made with dairy. That said, I wasn’t a big fan of the “fake meat.” I’m pretty picky about soy meat as it is, and to me this had a very soy-like taste (though with more of a deep flavor, kind of like a vegan hamburger taste almost). Given how picky I am about fake meat products, others might like the soy meat in this more than I did – I would give it a try if you’re vegan and a fan of Indian food. Personally, I would even consider buying it again just to eat the sauce and the rice together. I am not vegan, but I have been trying to reduce animal protein in my diet for health reasons. I cannot get enough of this dish! The sauce is amazing, and there is enough of it to disguise any soy taste I might not have found so appealing. The texture of the “meat” is pretty convincing, especially if you cook it a little longer (drying it out adds a bit more bite). It is much denser than the paneer, and only a little less than the chicken. This dish seemed at first on the small side, but is so packed with protein that it is quite filling. I am going through 2-3 of these a week. They are a quick easy office lunch option, and my coworkers haven’t killed me yet for filling the break room with the smell of Indian spices. I am typing this up as I eat this, for the first time. I’m not a vegan so I was a little skeptical about frozen vegan Indian food. I even took a whiff of the rice before putting it in the microwave and was pleasantly surprised! It tastes SO delicious. The masala is the perfect consistency, perfectly spiced (not too much, not too little). The only drawback (which isn’t a big deal for me) is the texture of the vegan meat. It’s a little rubbery but when you’re hungry, I don’t think you need to be picky about texture (unless it’s really awful like tempeh). Overall, I LOVE the vegan tikka masala and would drive 2 hours again to fill my freezer up with this. Thank you, Trader Joe’s for making me so happy!! I LOVE this stuff. It is truly amazing but I could do without the fake meat substitute. Other than that, the sauce is truly delicious; creamy and packed with spices and flavor. I love it, including the fake meat which is very convincing imo. 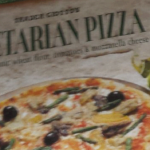 I am not vegan or vegetarian. I am a vegan, but with that being said I am also very picky and grew eating very traditional foods. I loved this dish, the sauce has such a nice flavor with a subtle kick and I didn’t mind the “meat” at all. At first I wasn’t too sure about the consistency, but after my next bite I really liked it and eating the rice, sauce, and “meat” together you couldn’t even tell the meat was vegan. Very impressed, but then again just about everything from trader joes is delicious so I’m not that surprised I enjoyed it as much as I did. 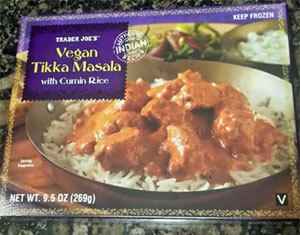 As a fellow vegan I was very excited to try Trader Joe’s Vegan Tikka Masala. I must say that this is absolutely delicious, to make this dish more spicy I added some cayenne pepper. The only draw back is my fears of gmo’s when I got home I read the ingredient list and was disappointed to find that this meal had: Canola Oil, Yeast Extract, Spices, and Sugar.. all considered common gmo’s unless labeled organic, other than that the meal was totally delicious. I don’t have a rating but I wanted to let Ms. Weekendgirl know that no TJ named products have GMOs in them. There’s more information in that link about TJ’s position on GMO. Not bad! The fake ‘meat’ was a little chewy, but I would eat this again – nice to have a vegan option that really tastes creamy like this. My freezer is currently stocked with too many of these. I absolutely love them when I’m just too busy to make dinner or get take out and really want something delicious and filling. I’m a vegan and not too big a fan of most soy products, but this is delicious. Once mixed with the sauce I can’t taste any soy flavor, and I really enjoy the texture, almost like traditional lamb. Sauce is very tasty but the fake meat was really nasty. I stopped half-way through my first package, tossed it out and reached for something else. Blech! I have very recently been trying to refrain from eating any animal product and going vegan, and I was really surprised at how delicious this was. I thought the sauce was really good and the rice was great too. The fake meat wasn’t too bad either. I am definitely going to be stocking up on this stuff. 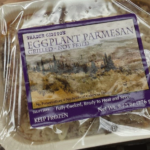 This is — by far — my favorite frozen meal from Trader Joe’s! I love the sauce, I love the rice, and I love the little protein chunks. I don’t know what lamb or chicken taste like, but these little chunks are pieces of heaven. When I say that I lick the bowl clean to get every drop of the spicy tomato sauce, I am not joking. Please, Trader Joe’s, send me the recipe for the sauce!! 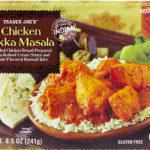 I’ve been vegetarian and lactose intolerant since i was a child so i have never been able to try the “real” tikka masala, and was thrilled to find this at trader joe’s! The flavor is amazing, it’s not too spicy and the sauce and rice is a great combo. The faux meat pieces are a bit large but i just cut them a little smaller. Really delicious filling satisfying high protein vegan meal! I like to serve it over fresh spinach which wilts a bit to add some veggies to the meal. As a a vegan I love the TJ Vegan Tikka Masala. The “meat” is delicious and has nice texture. 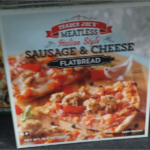 I read and re-read the ingredients and still don’t know what the “meat” actually is. I’ve been told that TJ’s products do not have GMOs in them but when I ask for proof all I ever get is “take our word for it” kind of answers. In this day and age I’d think TJ’s would want to prove to us their word is good. If they ever are proven to be lying it will crush the company. In the meantime, I love this food and want larger portions. This is my favorite frozen meal. Everything about it is awesome, including the “meat”. Not sure what the others are on about, it has a great flavor and texture. I wish I knew what it was because I would use it as a substitute more often! Love with a capital Ove. Texture, taste, consistency – yum. Only correctables: make it bigger! i’m still hungry; and improve the packaging. I don’t think you’re supposed to put plastic in conventional ovens (I went rogue and put it in an enclosed casserole dish – sublimely perfect.) Keep it up TJ’s! I should start off by saying I usually am not a fan of Indian food, and I hate curry, but this is one of my top 5 favorite Trader Joe’s products. I will sometimes have one for dinner 5 nights in a row. The sauce is very creamy & rich tasting. They are generous with the vegan “meatballs”. My only complaint would be the rice, sometimes it just tastes moldy. I don’t believe it’s actually moldy, it just tastes that way to me. The sauce covers up that flavor thankfully. I always have these in my freezer,. I always toast up some Trader Joe’s sourdough bread, slather with vegan butter, & dip the toast in the extra sauce. Amazing flavor but terrible value. Make these bigger! It’s vegan, meaning there’s no expensive meats, eggs, or milk in this, so why not make it 30% larger or at least drop the price 30%?